This is very good reproduction of a booklet originally published in 1847. The author is unknown but she is only identified as "An American Lady." This contains patterns for knitting, netting, and crochet work. 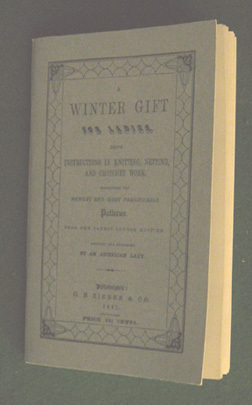 The booklet has about fifty knitting projects -- although some are just variations of the instructions for an earlier project -- stated in the original period instructions. They range from items as small as garters on up to a blanket that requires 2 1/2 pounds of yarn for a 4' x 5' blanket. In the netting patterns there are almost twenty projects. Some of these are, like the knitting patterns, variations of an earlier pattern and not a completely new design. The last technique, crochet, consists of eleven patterns. A lot of them are either gloves, mitts, or socks. Although most patterns call for wool, there are are two patterns (one for a pair of men's gloves and the other for a purse) that involve using silk to crochet. I'd love to see that pair of men's gloves! (K) Four Beautiful Patterns of Lace Edgings for Collars, Dresses, &c.
(K) A Gentleman's Comforter. Double Knitting. (K) Pincushion Cover. Leaf Pattern.